So you’re learning how to dance tango, enjoying it for the most part, but not yet ventured out to the milongas (the social tango dances). Or maybe you tried it, but got scared and haven’t been back? Fear not, some friendly guidance is at hand! What makes a dancer ‘ready’ for the milonga? While the particular milonga or community in question can be a factor, it chiefly comes down to your own outlook. 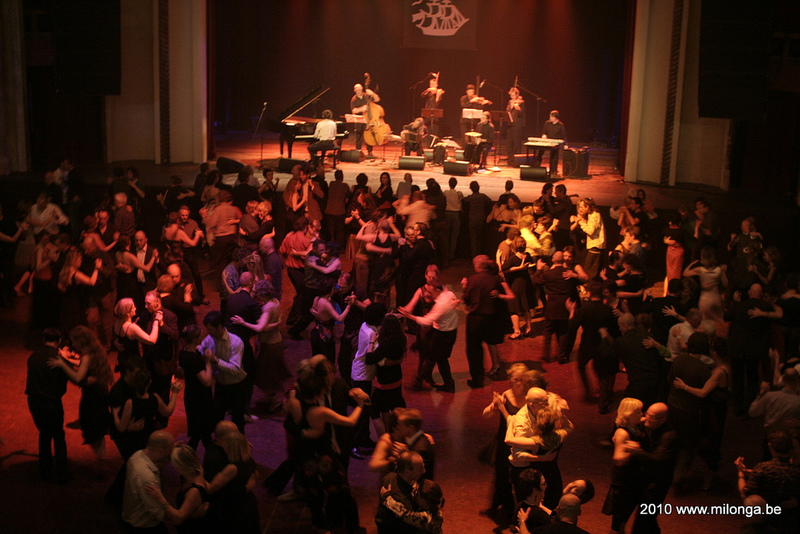 Obviously if you’re going to a place where people gather to dance tango, it helps to know a little tango – along with the basics of milonga etiquette (which is mostly common sense, like trying not to hit or obstruct other dancers) – but beyond that, your outlook is the decider. If you’re a relatively inexperienced dancer and your outlook is such that you think because you are inexperienced, other dancers will find it unpleasant to dance with you, then you are not ready for the milonga. Your fear and shame will make you stiff, self-critical and miserable, which in itself will make you hard work to dance with and will lower you chances of getting dances. Consequently you’ll come away with your belief reinforced. However, if you’re just as relatively inexperienced a dancer and your outlook is such that you think while your inexperience might mean other dancers are not able to do all the movements they enjoy doing, that it is nonetheless perfectly possible for you and them to enjoy a dance, then you are ready for the milonga (providing you have the very basics of walking with the music in an embrace, while avoiding collisions with other dancers). The deciding factor here is only your outlook. One determining dimension of this outlook is how you hold on to feelings of guilt, fear and shame; relating to how you dance and the influence that may have on others, or the judgements they may make about you. Another (related) dimension is how open minded and inquisitive you are about what you’re learning. Can you treat your learning process as a stimulating and playful process of discovery, without obstructing and derailing yourself with judgement (rather than simple observation, which is certainly useful) and giving in to fear? This isn’t to say that if you sometimes feel bad about your dancing and judge yourself harshly you have no place in the milongas (otherwise they’d be empty), or that you need to already be ‘happy’ to go out and dance tango. The point is simply that in order to get and give the most enjoyment in a milonga, having a positive, relaxed and open minded outlook relating to your dance and your partner is the overriding factor. Even with the most modest amount of tango experience, with the above kind of outlook you can have a delightful time at a milonga. Actually, drawing on personal experience here, outlook and attitude is so fundamental to the quality of your milonga experience that even for fairly seasoned tango dancers, if the way you’re relating to your own dance (or that of your partner’s) is getting crowded with criticism or doubt on a particular occasion, you’ll have a hard time having a good night. It can be easy to become self-critical and think „I’m just not good enough“ or „I’ll never get it right“, when you’re very focused on technique – in combination with a certain kind of outlook. But this does not help you, firstly in absorbing the technique and gaining the freedom it offers, and secondly in expressing your passion and joy in movement with the music and your partner. A vicious cycle can develop where you just go to classes and think „I need more confidence first before I go the milongas – and better technique will give me that“ but your present outlook is reinforcing itself in your technique focused classes – especially if your being introduced to a technique that has some subtlety to it and takes time and much practice to really absorb. Remember, a technique applied without a sense of fun, passion or playfulness can hardly make up a dance, and dancing tango is what presumably you’re aiming to do. So try to enjoy even your mistakes; by smiling and focusing on the stimulating process of learning and discovering new possibilities. You probably guessed by now that part of breaking this cycle of thinking you’re never quite good enough to dance in the milongas, is to get out and just do it. Going to milongas, really, is part of learning to dance tango. Yes, perhaps you’ll be one of the least experienced dancers there, for a while, and at times that may feel daunting. (There may even be the very occasional, odd person there who turns their nose up or says something discouraging. Although most communities are pretty friendly if you come with a positive attitude). But providing you can maintain a constructive, learning-friendly outlook, you will soon find your feet. In fact, as much as anything, I’ve found that the less experienced dancers who have that outlook are admired by other dancers for their bravery for showing up and diving in, and they are encouraged and supported. As an aside, you may notice when you are at a milonga that some of the people look very serious when they’re dancing, austere of forbidding even. You may find the sight of this makes it hard for you to just relax and enjoy the dance. However when you realize why they’re doing that, it may not concern you any more. For perhaps most of them, the serious look is merely a sign of concentration or focus (which the tango experience can benefit from to a degree), nothing more. For the rest, I think, they just see the others looking that way, assume that’s how you’re supposed to look when dancing, and so copy them. But you don’t have to. Here’s some quick tips for those just on the brink of going to milongas, and perhaps lacking a little confidence. Check your outlook. Review the above content, and remember as a beginner what makes the difference between a pleasant dance and a slightly fraught one, is how relaxed, positive and open minded you are. To a large extent it really does come down to a trick of the mind. 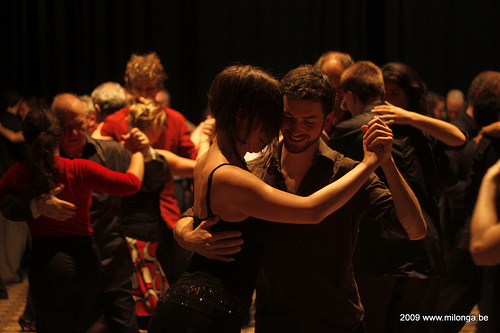 When at a milonga, get off to a good start by smiling, being friendly and starting conversations. Also, consider the flip-side of being a beginner or near beginner; many more experienced dancers enjoy dancing with beginners (who have reasonable balance) because they are: fresh, enthusiastic, easy to please/no high expectations, open minded etc. If you can manifest those qualities you will more easily be a pleasure to dance with, even with little experience. Keep it simple (obviously) and play with the known. Once you know how to walk to the music in an embrace and perhaps do some crosses and ochos you have a veritable ocean teeming with all manner of possibilities. In fact, when you start to unravel what you can really do with just walking, crosses and ochos it can be overwhelming. So simplify it further. For instance, for leaders just focus on walking for most of a song, but really hitting the beat, being grounded and confident in each step and then perhaps seeing if you can alter the character of your steps depending on whether the music is soft or hard in its character, or varying the step length. As an experiment, compare how many warm smiles and hugs you get from your partners doing just that, with how many you get attempting more complex moves you don’t quite understand yet. For followers, keeping things simple and playing with the known can be understood as focusing on your core technique of mirroring the leaders intention while maintaining a strong, comfortable and grounded posture. In a sense just about every step you take as a follower can be understood as a forward, back or side step, with perhaps a pivot in-between steps. The key to seeing and feeling that simplicity is to wait and slow down a little. Be patient with yourself. The opportunity to play with these knowns comes from your groundedness. For starters you can then vary the level of presence in your embrace to alter the speed of a step, or even initiate a stop. As an experiment compare how many warm smiles and hugs you get from your partners by keeping a good and well balanced posture while waiting for the lead and providing a positive and confident presence in the embrace, with how many you get by going off on your own trip, racing ahead (or letting yourself be rushed) or not taking care of your own balance. Listen to tango music. The music is the bridge on which your own individual dances can meet and be expressed in harmony. It is a guide to your movements and the quality of your movements. Get some CDs, download some mp3, let it seep into you. You will then get to know the patterns within the music and your body will be more readily able to express them, with various combinations of simple steps in different timings. Practice what you’ve learnt. But how can you keep things simple while at the same time practicing the new steps you learn in a lesson? It’s called a practica (practice tango session). You do go to a practica don’t you? If not, I suggest you do. If there isn’t one close to you, then consider starting one up. Finally here are some canned responses or reactions you may find helpful in your early milonga days. Go to the balanceo (which is often used a lot in a tango dance anyway) for a couple of beats or so, readjust and set off again. If it persists, make a note to bring it up at your next practica and with your teacher. Well, that’s it. Dive in, and good luck!